Tickets are no longer on sale as this production has ended its run. The National Theater of China presents Richard III. Photo by Liu Weilen. 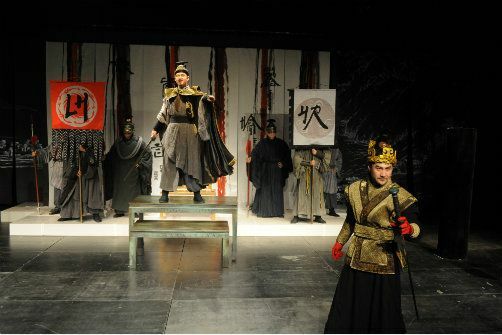 BOTTOM LINE: The National Theater of China performs one of Shakespeare's greatest histories in Mandarin. There are some who believe that the core of Shakespeare's greatness was his language. There is no denying the beauty of the Bard’s words or the playful, inventive way in which he manipulated them. But there are those few, those happy few, who believe that Shakespeare’s true genius lay in the humanity of his work: how his stories speak to the human condition and thus resonate in any language. In 2012, as part of the World Shakespeare Festival, the Globe Theater in London played host to the Globe To Globe festival: a presentation of 37 Shakespeare plays, performed in 37 different languages. At Globe To Globe, audiences could experience Troilus and Cressida in Maori, The Taming of the Shrew in Urdu, and the Henry VI trilogy in Serbian, Albanian and Macedonian. A production of Love’s Labours Lost was performed entirely in British Sign Language. The six-week festival was attended by over 100,000 audience members, 80 percent of whom had never been to the Globe before and proved the elasticity of Shakespeare’s work. Richard III, one of Shakespeare’s most popular historical tragedies, was represented at the festival by the National Theater of China and performed entirely in Mandarin. That production appeared last week at Skirball Center for the Performing Arts as part of a NYU’s Visions + Voices series: a celebration of Chinese art and artists. Directed by Wang Xiaoying, Richard III remains the same story of a corrupt politician’s blood-soaked rise and fall from power. This production, however, also incorporates elements from Macbeth into the narrative, bringing the focus of the play to the spiritual and psychological conflict of the Duke of Gloucester. The actresses who play the three queens in Richard III (Margaret, Elizabeth and Anne) also play three witches who taunt Richard with prophesies of his ascension and downfall. Towards the end of the play, when Richard’s sins have come home to roost, Richard sees his own hands stained with blood in the same manner as Lady Macbeth. More interesting is the way this production plays with Richard’s physicality. Shakespeare’s Richard III is famously hunchbacked, and his deformity baldly represented the character’s twisted psychology. As performed by Zhang Dongyu, though, NTC’s Richard is only disfigured in the soliloquies that reveal his evil machinations. When in the company of those he manipulates, Richard is tall, unbent, and handsome. It is a refreshing and effective portrayal of the villain that only purists might quibble at (though it should be noted that Shakespeare’s portrayal of Richard III is itself a hugely distorted take on the actual historical monarch). What distinguishes this production of Richard III most of all, though, is its Chinese aesthetic. Wang stages Richard III with different elements of Chinese theater. Lady Anne, for example, mourns her dead husband in a stylized Peking Opera fashion but when confronted with Richard’s near-comical seduction, her mannerisms drop and her voice becomes harsh. The two murderers who dispatch Richard’s brother Clarence were played by acrobatic clowns (the nimble actors earned the biggest laughs of the night). I know very little about the various traditions in Eastern theater myself. What I have seen is wildly different from my Western cultural experiences, but I am also the kind of theatergoer who likes to be surprised and challenged by the shows I see. This Richard III was exciting to me because it is not the kind of show I have ever seen before. It made me hungry to learn and see more, and the first step I took in that was journey was staying for the talkback after the Thursday night performance I attended. I learned a lot at that talkback, but something an audience member asked struck me more than anything else. A young man, possibly an NYU student, asked Wang Xiaoying and dramaturg Luo Dajun if this play was censored in anyway when it was performed in China, due to its depiction of political corruption. Wang seemed visibly taken aback by the question; whether he was offended or surprised was difficult to tell, but it certainly had an effect on him. Wang explained, through a translator, that the play was meant to portray the darkness and potential for evil that exists in every person and was not explicitly political in nature. After some research I learned that the works of Shakespeare were banned for a decade during China’s brutal Cultural Revolution. Chairman Mao recognized the power and influence Shakespeare had and how it threatened his ideology. Today, Shakespeare is taught in most Chinese universities in both English and Chinese languages. May Shakespeare always belong to the world.